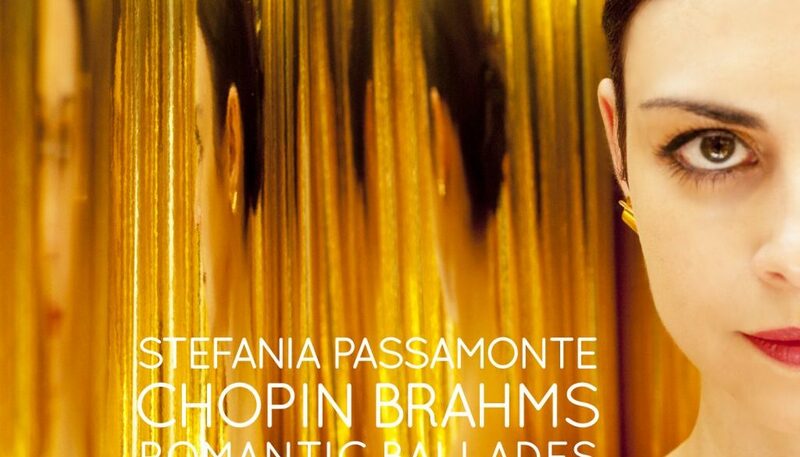 Brahms and Chopin may seem to be at opposite ends of the Romantic spectrum, but Italian pianist Stefania Passamonte demonstrates here that they have much in common. We are used to hearing Chopin played with a great deal of rubato and Brahms played straight (or more so), but the music of both composers can accommodate a wide range of approaches. Passamonte is relatively reserved in her use of rubato and rarely exaggerates the various rhetorical gestures she meets in these scores. She brings Chopin closer to Brahms, imposing a Brahmsian sense of order to Chopin’s often long and meandering melodies. Her dynamic range is also quite limited, but this too becomes a virtue, as she is able to carefully grade the dynamics to create infinite variety within these self-imposed limits. The result is a series of performances that avoid the worst excesses that these composers (Chopin in particular) are regularly subjected to, but that maintain the expression and vitality that is so important here. The music is always carefully disciplined, but never at the expense of its Romantic identity. The programme opens with Chopin’s Four Ballades. From the very beginning we hear carefully controlled sound production and precisely graded dynamics. The quiet opening is typical of all the gentler sections on the disc, in that Passamonte doesn’t exaggerate the sentiment. The simple texture is presented in a very straightforward way, not so much naive as direct. This allows her to gradually increase the passion and the emotional involvement as the music works up to its first turbulent climax. But even in this and later note-heavy passages, Passamonte still maintains absolute clarity in her textures. She never lets the complex music carry her away, and the control that she exerts allows her to skilfully guide and structure each of these movements. The Second Ballade opens in an even more simple and delicate mood, and Passamonte very sensibly allows the melody to play out without any major interventions or obtrusive pedalling. And again, when the music builds up to its con fuoco climaxes, Passamonte gives it all the drama it needs, but without ever losing the pinpoint clarity of the lines or the carefully graded balance between the hands. The Brahms Op. 10 Ballades are presented in a similar style, a style which is perhaps more closely associated with this music and therefore more mainstream. But again, the avoidance of excess, in dynamics, rubato and pedalling, brings a valuable sense of discipline to each of these works. This music can easily sound pompous in the hands of more pretentious pianists, the Second Ballade in particular, but the steady tempos here and the unswerving focus on the melody, prevents Brahms’ textures from ever sounding too overblown. Passamonte’s ability to finely grade dynamics in long crescendo passages is a particular asset in the Third Ballade. This work also shows off her articulation skills, as the music’s generally flowing character incorporates a range of touches, requiring greater or lesser separation, all of which is executed splendidly. My only complaint about the recording is the sound quality. While it is not bad, it is not even close to the highest standards possible today. (I should mention that I have only heard the mp3 version, and the CD might be considerably better.) The piano, a Steinway B, lacks resonance across its range, at least on this recording. In Brahms’ Third Ballade, the central section floats up into the top register, but the sound there lacks the ethereal quality the composer is surely looking for. Similarly, Chopin’s Third Ballade makes extensive use of the bass register, and while the notes are laudably clear (thanks, no doubt, to Passamonte’s expert touch) there is little of the resonance and warmth that usually characterise this work. Nevertheless, the performances alone make this CD worth hearing. All of these Ballades are represented by long, long discographies including contributions from some of the 20th century’s most distinguished pianists. But they are works that allow players to project their personality and musical values strongly, and that’s exactly what Passamonte does. She demonstrates a musical approach based on a fine balance between discipline and passion. It’s not overly simple, but it’s not contrived or bombastic either. This is elegant and stylish piano playing, and it presents both composers in the best possible light.